CAIRO — A leading Egyptian pro-democracy activist was freed from prison early Friday after serving a five-year sentence for organizing and taking part in protests, his family and lawyer said. The terms of his release, however, require that he report to a police station every day for the next five years. Alaa Abdel-Fattah rose to prominence with the 2011 Arab Spring uprisings that swept the Middle East and in Egypt, toppled long-time President Hosni Mubarak. To many, his imprisonment three years later — at a time when authorities imposed draconian laws banning public gatherings and unauthorized demonstrations — was another sign of Egypt's return to autocratic rule. Abdel-Fattah's sisters, Mona and Sanaa Seif, posted on Facebook that "Alaa is out," along with a video of him at home, playing with a dog. 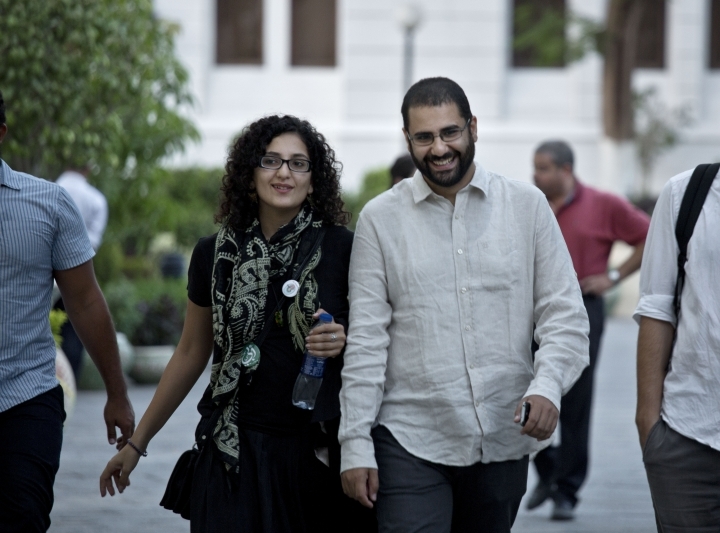 His lawyer, Khaled Ali, confirmed the release by posting: "Thanks God, Alaa Abdel-Fattah at home." Facebook pages set up in support of Abdel-Fattah, including "Free Alaa," posted videos of him grinning, hugging and shaking hands with friends as he walked out of a police station in Cairo. In the background, women were ululating. Later in the day, he was pictured massaging the feet of his child Khaled, who was born shortly after the 2011 uprising. Though out of prison, Abdel-Fattah's sentence stipulates that for the next five years he will be under "police observation" and must report to a police station every day. In some cases, released convicts only sign a logbook and then leave the police station but in others, measures are hasher. Photojournalist Mahmoud Abu Zaid, popularly known as "Shawkan," who was released earlier this month also after a five-year term, must stay overnight at the police station for the next five years. He is also prohibited from managing his financial assets and property for the duration of those five years — measures that Amnesty International has called "outrageous." 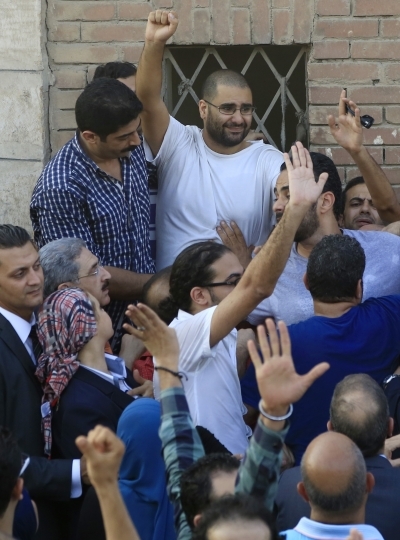 It's unclear to what extent that part of Abdel-Fattah's sentence will be carried out. An outspoken dissident, Abdel-Fattah was detained several times before under different governments for lobbying for civil rights on social media and in public. An influential blogger, he hails from a family of political activists, lawyers and writers. His late father was one of Egypt's most tireless rights lawyers, his sisters are also political activists and his aunt is award-winning novelist Ahdaf Soueif. "We're overwhelmed with joy that he is out and amongst us, but I also feel how wrong it is that he spent five years unjustly in prison," the novelist told The Associated Press over the phone from London. "We are heartened by the amount of joy his release has generated across the world," she added. "We hold everyone who is still unjustly in prison, everyone who's been disappeared, very much in our hearts and thoughts." Abdel-Fattah's five-year sentence was his longest prison term. He was convicted for taking part in a peaceful demonstration following the military's ouster in July 2013 of Egypt's freely elected but controversial Islamist President Mohammed Morsi. After Morsi's ouster, Egypt's military-backed transitional authorities waged a heavy crackdown on his supporters who had rallied against his ouster, including a sit-in by Islamists in Cairo that was broken up by security forces in an operation that left hundreds dead. Within weeks, the government also went after secular and liberal activists who opposed a newly introduced law banning street protests without prior permission from authorities. The new law required participants to formally ask the Interior Ministry three days in advance whether they can hold a rally while also setting prison terms and high fines for violators. The demonstration that led to Abdel-Fattah's arrest and sentencing was against trials of civilians before military tribunals, known for their swift and harsh rulings. "I don't deny the charge," he wrote in a statement released at the time. "It's an honor to hold responsibility for people's rallies in defiance of legalizing the return of" Mubarak-style rule. Egypt under current President Abdel-Fattah el-Sissi, a former general, has rolled back many of the freedoms won by the 2011 uprising. El-Sissi has silenced most dissenting voices in the media and placed severe restrictions on civil society groups. The Muslim Brotherhood, from which former President Morsi hailed, has been outlawed as a terrorist group.